Best DSLR Under $500: Before we shine a light on the best budget DSLRs of 2019, we should explain that one important factor you should keep in mind while choosing the best digital SLR as per your requirements. First of all, there’s not much difference between a $500 & $1000 DSLR in terms of image or video quality. Dissimilarities of prices mainly lie within the sensor size of the camera, between the range of $500 to $1200 they all have cropped sensor. A digital SLR cropped sensor is equivalent to 24 Smartphone camera sensor and sensors really play a key role when it comes to image quality. That’s why it makes more sense buying a $500 DLSR and having some extra to spend on lenses to explore your creativity unless you are ready to drop more than $2000 for a full frame Digital SLR. Check our list of Best DSLR under $500 as we pinpoint the top models of 2019. 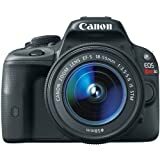 Replacing the ultra affordable Canon EOS Rebel T3, we now have the Canon EOS Rebel T5 as the most affordable DSLR camera. Well! can it be named as the Best DSLR under 500 Dollars? Let’s find out. With a complete matte and textured finish; weighing at around 1.06 pounds, Canon EOS Rebel T5 is definitely a great entry level DSLR for beginners. The Rebel T5 comes with 18MP CMOS sensor and a DIGIC 4 Image Processor which allows capturing continuous photos at 3 fps. It can even capture 1080p video at 24fps and 30fps. For a DSLR under $500, you get a 9-point Autofocus system; however it’s not as fast as other hybrid autofocus systems. The size is optimum for users switching from small point-and-shoot cameras to professional photography DSLR camera without feeling incredibly heavy. Even being an entry level DSLR camera, we still have it in our list of Best DSLR under $500 because Canon hasn’t left any stone unturned while making the Rebel T5. For amateur photographers it’s definitely a huge leap from average point and shoot cameras all the way to this entry level DSLR in terms of image quality, features and add-on options. With a no non-sense design, easily accessible features and light weight allows Canon EOS Rebel T5 to be a great option for people wanting to try their hands on professional photography. Every DSLR needs to go with a set of accessories for you to take full advantage of all it’s included features. Hence along with mentioning the Top 3 Best DSLR under 500 Dollars, we’ve also handpicked some of the best accessories to go along with your DSLR. Lenses: Recommended to buy as Bundle : Detachable lenses are the reason why DSLR cameras are so popular among Professional Photographers. Almost all cameras come with a 18mm-55mm lens as default. Affordable DSLR Camera – Bundle Accessories : However another popular lens is the Zoom Lens which if bought externally may cost as much as the DSLR camera itself. Hence I’d recommend buying it as a bundle with the camera which makes it a cheaper deal. Hence before buying you can check various bundles that Amazon.com provides with your cameras. Memory Card: SanDisk Ultra 64GB Class 10 (80MB/s) : We all know, that image size of DSLR captured pictures is very high; hence you do need a memory that’s not only fast to process those images but also store a huge number of them. Sandisk 64GB Ultra Memory Card for Affordable DSLR Cameras : Hence having a huge size memory card won’t hurt either. However if you need more you can definitely considering settling off with a 128GB Memory Card Version. Tripod: Ravelli 61-inch Aluminum Tripod : Tripod is definitely a must-have accessory if you’re going to do it the professional way. One from Ravelli is perfect fit for your DSLR with a max height of 61 inches that also comes with a carry bag. Check the tripod in action here. However if you want something more complex and stronger built quality for rugged use, you’d be better off settling for the Manfrotto MT055 3-Section Tripod or Vanguard Alta Pro 263AB Aluminum Tripod. Isn’t this a better way to charge your DSLR when not in use? Yes, it is. Check Full Review! To remove this shake, you can use a Shutter Remote which will give you a ultra stabilized image and also help while taking pictures from tripod during situation where is hard to bend, look into viewfinder and take a shot. Camera Bag: AmazonBasics Backpack for DSLR Cameras : With a DSLR camera comes tons of accessories and you require a safe way to keep them all safe and in one place.This backpack from AmazonBasics provides tons of options to not only store your DSLR and its lenses but also all the other accessories you carry along for a very nominal price. Check it in action by clicking here. Nikon D3300 is an upgrade to the previously released D3200, lightest of all Nikon DSLR Cameras and weighs at 0.95 pounds and hence is featured in our list of best DSLR under 500 dollars. With this entry level Nikon DSLR you get a big 24.2MP APS-C CMOS sensor along with Nikon’s own EXPEED 4 Image Processor. EXPEED 4 Image Processor is better compared to Canon’s DIGIC processor as it allows capturing highly detailed 5 Pictures per second.You even get ISO in the range of 100-12800.With the new image processor, battery life has increased exceptionally. With a battery of 1230mAh allows you to capture 700 images on full charge. NIKKOR lens on the Nikon D3300 also adds VR (Vibration Reduction) feature, which offers great stabilized image during travelling. Talking about build quality; it’s extremely sturdy… since it comes packed in a polycarbonate body and a strong grip. You can get three color options: Black, Grey and Red. Since it’s an enty level DSLR, you get a 92K dots 3” screen along with a good user interface which is useful and descriptive for new users. For my experience Nikon D3300 isn’t as user-friendly as a novice user would like to have in an entry level DSLR. 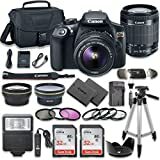 This Best DSLR under 500 Dollars is an incredible upgrade in terms of features and specifications compared to previously mentioned Canon EOS Rebel T5. If you want to upgrade from your age old DSLR to an affordable DSLR Camera, Nikon D3300 it is. 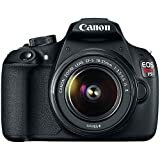 If you want to take a look at the lightest and best DSLR under 500 Dollars, here it is.With a weight of 0.9 pounds, it’s the currently the lightest DSLR model available in market today and ‘the’ Best DSLR under 500 Dollars.Canon EOS Rebel SL1 comes in two colors i.e. Black and White. Both of them have a textured design towards the right that provides proper grip and matte finish towards the left. Out of the box, it comes with a 18MP APS-C CMOS Sensor and a DIGIC 5 Image processor.For $100 more… the Canon EOS Rebel SL1 is a serious upgrade compared to previously mentioned Rebel T5.Best part about the Rebel SL1 is; at an affordable price it comes with a 3” touch screen display, which offers quick touch response and rich color display making every features a breeze to use. Hence if you’re a beginner without prior experience using DSLR, you can easily use the touch screen to change settings… without having to fidgeting with buttons and other options.Low light photography on Rebel SL1 is also a breeze since the ISO runs from 100-12800. However do remember, higher the ISO… more the grainy picture.One excellent feature that Canon provides is the ‘Creative Auto’ mode.Using this, novice users can use sliders to adjust various settings rather than fidgeting with numbers. Hence if you’re doing macro photography and want to adjust the level of blurriness in the background, you can move the sliders and the camera adjust settings itself without you having to do anything. This is the reason why we’ve featured this in our list of Top 5 Best DSLR under 500 Dollars. Canon EOS Rebel SL1 is for novice users who want the luxury of a DSLR combined with the usability of a point-and-shoot camera at the same time. You just cannot go wrong with this. Canon Rebel T6 is one perfect digital SLR to start with that comes with the entire basic beginner modes like portrait, sports etc. It also has aperture, shutter and menu modes for more advance photography. Overall, T6 is a camera for beginners and it won’t really work that much for professional photographers. The three inch LCD screen of it comes with nine hundred and twenty thousand dots, which is pretty good in broad daylight. It is also incredibly easy to get around the menus and change settings as per your perception. There is also lot more settings in Canon Rebel T6 apart from general features that you can actually change by just changing the dial to menu mode. Overall, Canon Rebel T6 is a good little camera in this price range and especially if you have never used a DSLR before, it will be a lot fun to learn on this camera. Nikon D3400 is a lightweight camera comparing to other DSLR in the same price range and you ought to enjoy photography with it as it feels very compact n hand. The LCD screen of D3400 is actually pretty good if we compare it to other Digital SLR we listed in this article. The screen works good under bright sunlight and it’s really sharp at the same time. Nikon introduced snapbridge technology in D3400, this might not seem exciting for seasoned photographers but it is actually good for those who are just getting into photography. Using snapbridge technology you can easily store your photos and videos from camera to phone. The camera can shoot 5 frames per second, that’s impressive for a beginners’ DSLR compared to competitor like Canon Rebel T6. If you want to take photos of sports or wildlife, Nikon D3400 will work decently compared to other entry level DSLR in this price range. As you would have seen above, for a budget price of $500, you get such an amazing range of affordable DSLR cameras that not only capture great images.but also are so much easy to use, aren’t they?